The NEC SV8100 Combination Trunk & Extension Card CD-LTA is used to connect 4 Analog Trunks (phone lines), 8 digital telephones and/or DSS Consoles, and 2 analog phones or single-line devices (such as a fax machine) to the system. This card is a perfect way for a small business to get started with the NEC SV8100 telephone system. The CD-LTA card contains everything a small office requires. 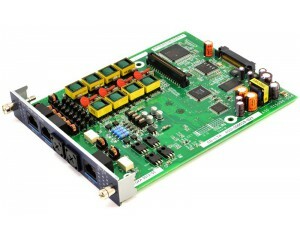 This card immediately enables the SV8100 phone system with 4 analog telephone lines (Caller-ID capable), up to 8 digital DT330 series phones and DSS Consoles, and up to 2 analog devices such as a cordless phone and fax machine.